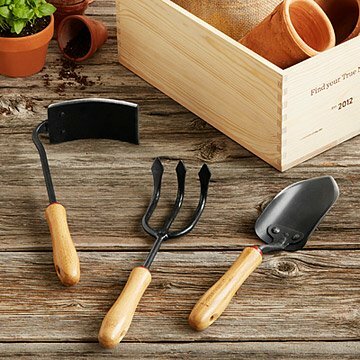 Encourage beginning gardeners with this beautifully made set of three starter tools. Often people who've never gardened think they don't have a green thumb, when all they really lack is confidence. A nice set of starter tools can help anyone feel that gardening success is within their grasp. Holding the smooth, comfortable bamboo handles of these heat-treated, rust-resistant stainless steel tools will embolden beginners and re-enthuse the experienced. Includes cultivator, spade, and hoe. Pine gift crate can be used as a planter for a gardener's first horticultural success. Made in China. For the blade: Rinse soil off digging tools after each use. Dry thoroughly. For the handle: Wipe down with linseed oil. This was a very thoughtful gift from my son and daughter-in-law. I love gardening and frequently have to replace my hand tools due to quality issues such as bending and breakage. These tools a really solid and well made with nicely honed edges. I have never seen tools of this quality before and wouldn't have likely purchased something this wonderful for myself.